By buying this product you can collect up to 3299 bonuspoints. 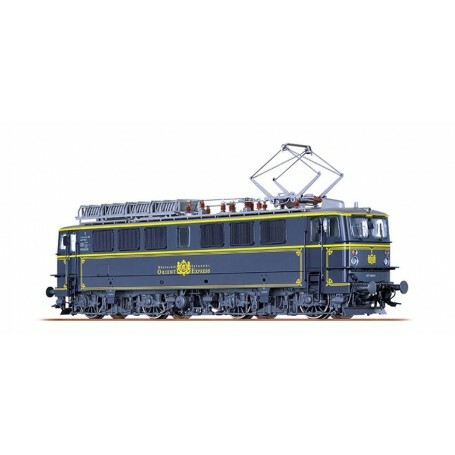 Ellok klass Ae 477 905-4 Lokoop 'Orient Express', med digitaldekoder och ljudmodul, slirskydd på två axlar, ljusväxling i färdriktningen, längd över buffertar 187,6 mm, epok IV. The nostalgic Orient Express was operated by the Schweizer Mittel Thurgau rail company (MThB). When the nostalgic Orient Express was driven under the contact wire, it was often connected to a locomotive which was painted in the special night blue color of the Orient Express. This was a locomotive of the series Ae477, a former E42 of the DR. In 1994, 12 of the E42 were sold to Switzerland.